Woman blowing her nose while dealing with pollen allergy. Fueled by warmer temperatures and increased carbon dioxide levels, pollen seasons are longer, and pollen counts are higher. Blooming spring flowers signal the beginning of spring, but for millions of people, they also signal the onset of the misery: allergy and asthma season. 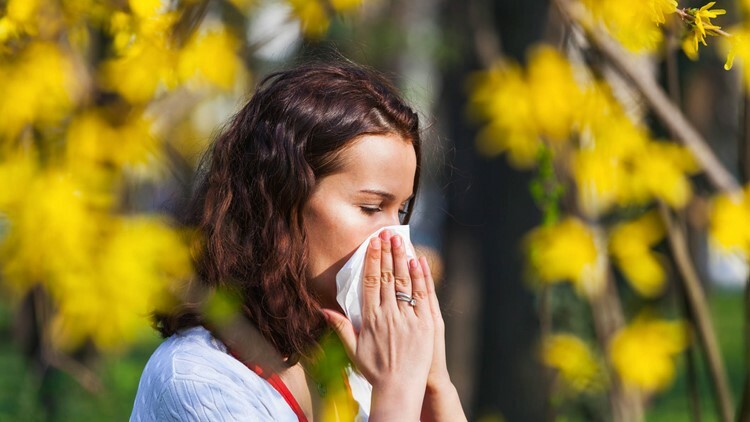 Itchy, watery eyes; sneezing, runny nose; cough and wheezing are triggered by an overreaction of the body to pollen. Every spring, trees and grasses release billions of buoyant pollen granules into the air, using the wind to disburse across the countryside in an effort to reproduce. It’s all about survival; plants that release more pollen have the survival advantage. As an adult and pediatric allergist-immunologist in the Midwest, the onset of spring signals my busy season treating hundreds of patients for their seasonal allergy and asthma symptoms. If you suffer through the season, know that you are not alone. Throughout history, pollen has taken the fun out of spring for many. In modern times, however, medical science has identified practices and treatments that help. Fossilized specimens of pollen granules have been found predating dinosaurs and alongside Neanderthals. And, sinus and asthma symptoms and treatments are documented throughout history and across the globe. People just didn’t know exactly how to treat the symptoms, or exactly what was causing them. For example, over 5,000 years ago, the Chinese used the berries of the horse tail plant, ma huang (Ephedra distachya), to relieve congestion and decrease mucous production associated with “plant fever” - a condition affecting people during the fall. In Egypt, the “Papyrus Ebers,” written around 1650 B.C., recommended over 20 treatments for cough or difficulty breathing, including honey, dates, juniper and beer. As scientific advancement was stifled during the Middle Ages, in large part due to the plague, it wasn’t until 900 years later, in 1819, that Dr. John Bostock published a description of his own seasonal allergies. But he didn’t know what was causing them. Having suffered from “summer catarrh” since childhood, Bostock persisted in his study of the condition, despite an initial lackluster response from the medical community. In the nine years between his first and second publications, he found only 28 additional cases consistent with his own seasonal allergy symptoms, which perhaps demonstrates the lower prevalence of the condition at the time. He noted that nobility and the privileged classes were more often afflicted by seasonal allergies. This was thought to be the consequence of wealth, culture and an indoor life. Societal changes with their roots in the Industrial Revolution, including increased exposure to air pollution, less time spent outdoors, increased pollen counts and improved hygiene, all likely contributed to the increased prevalence of allergies that we continue to see today. They also helped form the hygiene hypothesis, which states that in part decreased exposure to particular bacteria and infections could be leading to the increase in allergic and autoimmune diseases. Bostock instead suspected the recurring symptoms were triggered by the summer heat, since his symptoms improved when he spent the summer on the coast. It would later became common for nobility and aristocrats to spend allergy season in coastal or mountain resorts to avoid bothersome symptoms. Through methodical study and self-experimentation, Dr. Charles Blackley identified that pollen was to blame for allergy symptoms. He collected, identified, and described various pollens and then determined their allergic properties by rubbing them into his eyes or scratching them on his skin. He then noted which ones resulted in redness and itching. This same technique is used in skin prick testing by allergists today. Inspired by discoveries related to vaccination, Dr. Leonard Noon and John Freeman prepared doses of pollen extracts for injection in an effort to desensitize patients with allergic rhinitis in the early 1900s. This effective treatment, called allergy immunotherapy, also known as allergy shots, is still used today. Antihistamines first became available in the 1940s, but they caused significant sedation. The formulations with fewer side effects that are used today have only been available since the 1980s. Though recognized by ancient civilizations, seasonal allergic rhinitis and allergic asthma have only increased in prevalence in recent history and are on the rise, now affecting 10 to 30 percent of the world’s population. Fueled by warmer temperatures and increased carbon dioxide levels, pollen seasons are longer, and pollen counts are higher. Many experts believe this will worsen in the coming years due in large part to climate change. What can you do? Often, those who are allergic need a multifaceted approach. Find out what allergens are causing your symptoms. Take note of when your symptoms start by making a note in a calendar or planner. Minimize exposure to allergens. Track pollen counts. When pollen counts are high, keep the windows closed at home and in the car. After spending time outdoors, shower and change clothing to prevent ongoing exposure to pollen. Take a pro-active approach to treating symptoms. Starting medications before symptoms develop can prevent symptoms from getting out of control. This can also decrease the amount of medication needed overall. Long acting non-sedating antihistamines are helpful for itching and sneezing. Nasal corticosteroid sprays are more helpful for stuffy noses. Consider a visit to see a board certified allergist/immunologist. She or he can help you determine which particular pollens maybe the source of your symptoms. Explore the role of immunotherapy with your doctor. Immunotherapy changes the immune response through administration of small regimented doses of allergens over time. This induces a state of tolerance, eventually helping people become less allergic over time. While pollen season is coming, taking a multifaceted approach can provide much needed relief from the symptoms that have plagued humankind throughout the millennia.